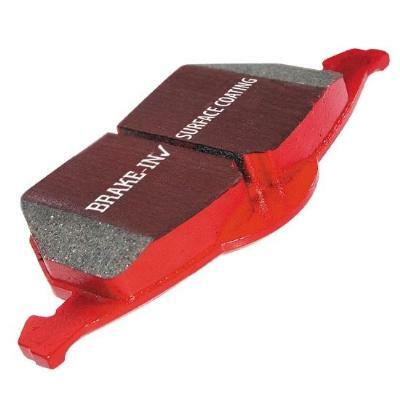 Redstuff brake pads, passenger car/saloon car pad NOT made for Truck or SUV fitments. Redstuff brake pads are however as a harder compound does take longer to fully bed in to achieve its highest levels of performance (can be up to 1500 miles/2500 Kms urban use) during which time the odd “Chirp” of brake noise may be heard when starting from cold in damp and cold conditions at walking pace speed. One press of the pedal to clear the rotor of any dampness and this disappears to leave EBC Redstuff a pad that inspires confidence in all cars. The motto is be patient give the pads a full chance to bed down. Redstuff is only available for heavier and faster cars and does find its self at its best on slightly heavier cars or Truck and SUV applications. Selecting the right grade of EBC pad for you car, truck or SUV is important and you can see the entire EBC selection and how to choose the right brakes for your car by switching to this linked page.